It was a day that changed the world of technology — forever altering not only how we communicate, but how we do just about everything — a day many will not forget. On Jan. 9, 2007, Steve Jobs, CEO of Apple, stood on a stage in San Francisco and introduced the world to the very first iPhone. Since its release, the world of mobile phones has changed drastically, with other technology companies creating their own smartphones. Over the last few years, the sale of smartphones has rapidly increased. With this type of phone becoming popular, more people are now owning smartphones. While smartphones are dominating the technology industry, mobile phones have been around since the 1970s. In fact, many people’s first mobile phone was not a smartphone at all. The flip phone and other types of cell phones have been around since the 1970s. These types of mobile phones were popular for several decades, but users could not do much with them besides make calls and text friends. With the introduction of smartphones, users can now do more than just make calls and text people. Smartphones have enabled users to do things they once had to do on computers, like post to social media, send photos to friends, play games and shop online. In fact, 51 percent of Americans report making online purchases using their cellphones, according to a Pew Research study. Shopping is one of the many industries which has benefitted from the smartphone boom. Shoppers can download specific shopping apps, find deals and coupons and even pay for things with their phone. In fact, according to a 2017 statistic reported by Outer Box, 62 percent of smartphone owners have made a purchase on their phone in the last six months. 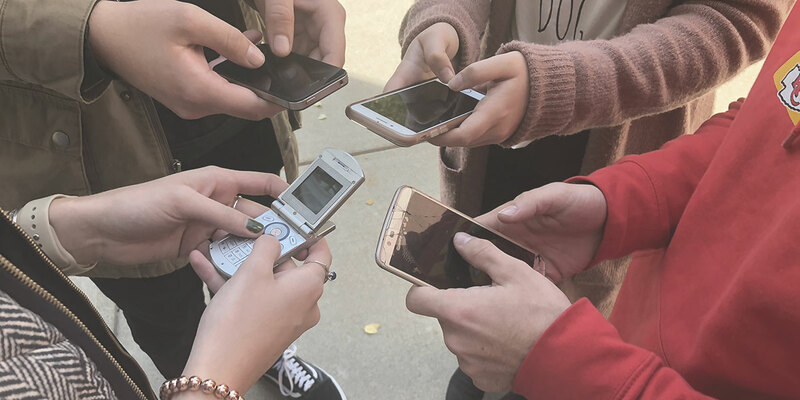 In addition, smartphones have allowed us to constantly be connected to our friends, jobs, school and the entire world. But with smartphones giving users access to social media, emails, texts and the entire World Wide Web, people have started using their smartphones constantly. In fact, smartphones have changed the amount of time we spend online. According to a Pew Research study, 26 percent of American adults now report they go online almost constantly, an increase from 21 percent in 2015. People have begun using their smartphones so much, studies and research suggest smartphone addiction is becoming common throughout the United States and around the world. According to a study by The National Center for Biotechnology Information, their study revealed that 70.4 percent of the study participants used their smartphones longer than intended and 66.5 percent of the study participants were engaged for a longer duration of time with the smartphone. In addition, studies have shown that using smartphones too much can have effects on our physical health as well. “The over usage of mobile phones has steered us into recognizable psychological illness such as personal illness, insecurity, low self-confidence, mood fluctuations, sleep disturbances, insomnia, neck pain and rigidity, dry eyes, computer vision syndrome, weakness of thumb and wrist, increased frequency of quervain’s tenosynovitis, nomophobia, delusions, auditory, and tactile hallucinations,” according to a study by NCBI. Smartphones have changed the way we communicate, and we can access the world from a small device in our pocket. While it is easy to see the benefits of smartphones, the downsides to this technological breakthrough cannot be ignored. What started as an idea several years ago has turned into one of the most important pieces of technology in the history of mankind. With the iPhone now over 10 years old, could Steve Jobs have envisioned the impact his idea would have on the world? Michael Klussman is a public relations major from Manchester, Missouri, and plans to pursue a career in the communication field after graduating. In his free time, Michael enjoys volunteering at his church and exploring the St. Louis area.